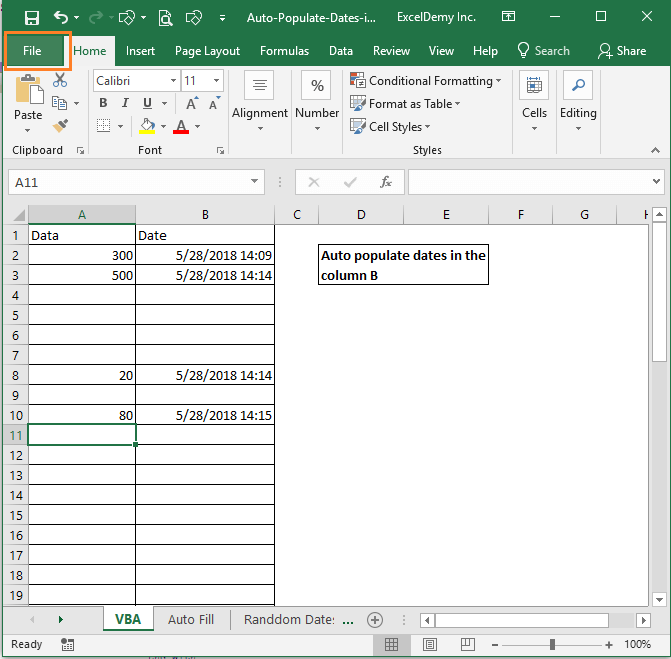 In this article, I will show you how to auto-populate date in Excel when a cell is updated. 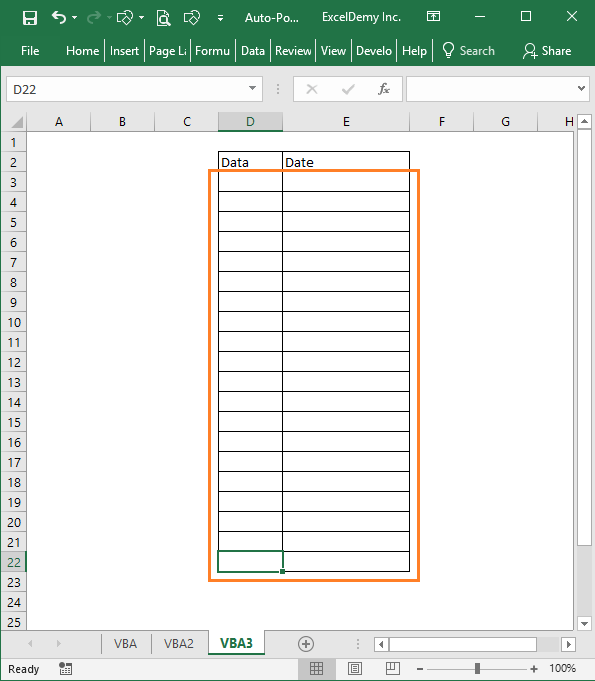 I will show the whole process using Excel VBA. I will also show how you can modify the code for your specific purposes. Sometimes several people work on a worksheet and anyone can update the worksheet anytime. So, the worksheet owner might want to see the last updates with the update date and time. Now the big question. How will you use this code for your specific purpose? Take a look at the following dynamic image. You see when I put some value in a cell of column A, adjacent column B cell show the date and time I am changing the cell. You update a cell and the adjacent cell shows the update date and time. This is the VBA code that I am going to use. Let’s show you where to put this code. 1) Click on the Developer tab. And then click on the Visual Basic command in the Code window. 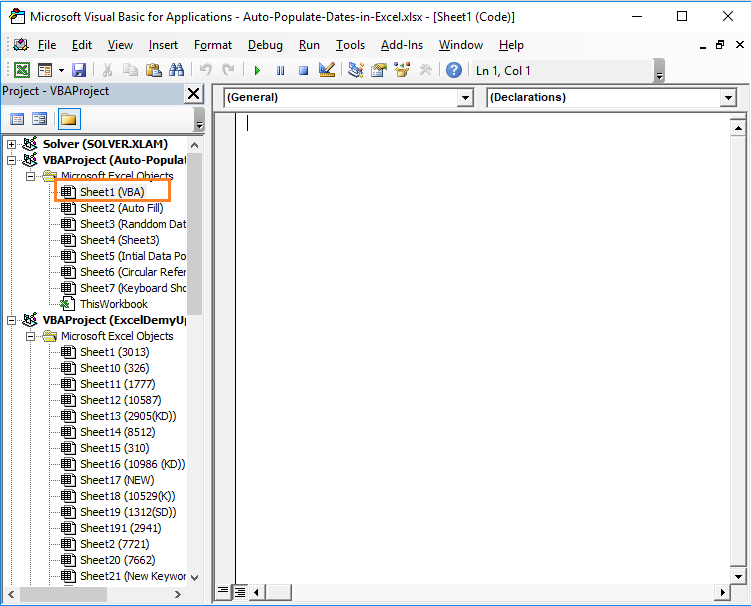 To open Excel VBA editor go to Developer tab and then click on the Visual Basic command in the Code window. 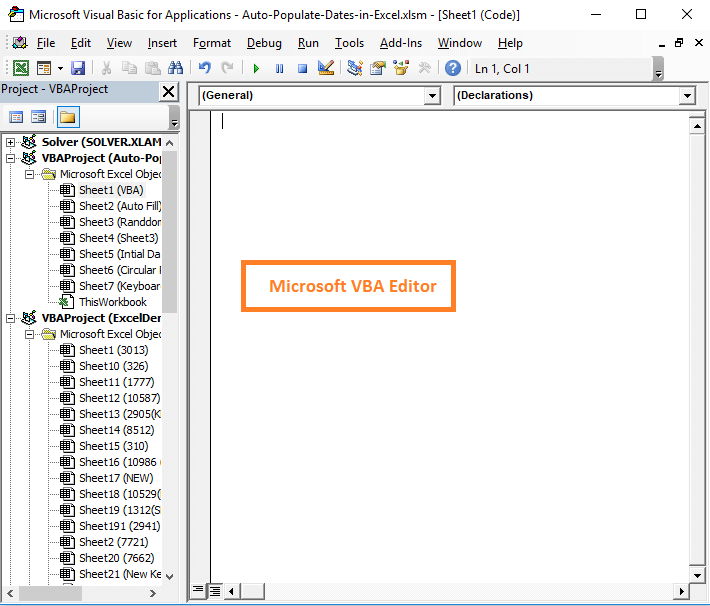 2) Microsoft VBA code editor will open like the following image. Keyboard shortcut to open this window is ALT + F11. 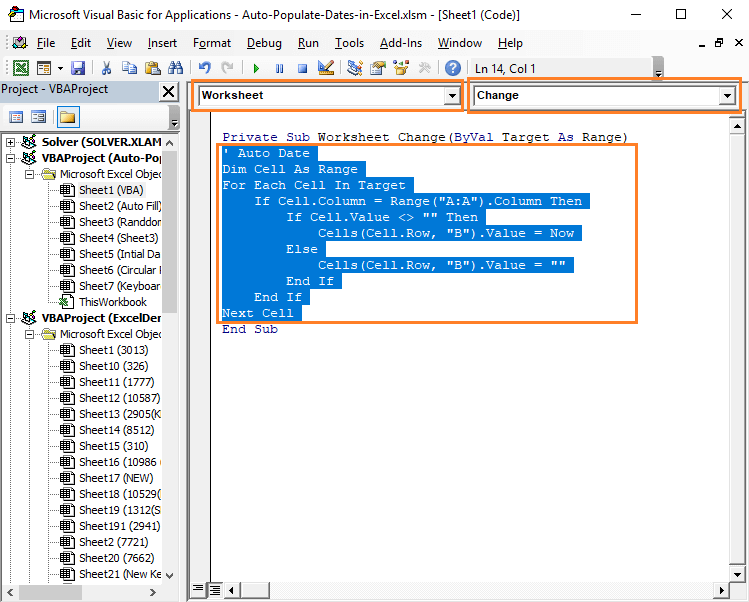 When you will open the VBA editor, it might show blank or the existing Macro codes already available in the same workbook or from any workbook open in your Windows system. 3) Double click on the worksheet on which you want to apply our code. So, you will find an editor look like this. 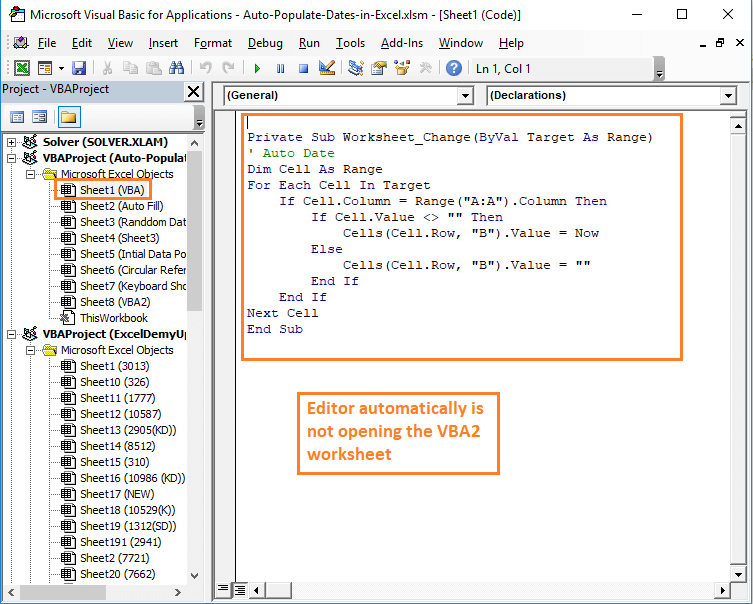 To open the Sheet1 worksheet (named as VBA) related code editor, double-click on the Sheet1 (VBA) on the left side of the editor. 4) Click the drop-down part of the (General) and choose Worksheet. Select Worksheet from the drop down (on the left side). When you will select Worksheet, all worksheet related pre-built functions will be available to you. 5) In the same way, from the right-side tab, choose Change option. You will find that two codes are appearing in the code editor. Select and delete the lower part code. Delete the SelectionChange related code from the editor. It is not necessary. I am suggesting to delete this part just for making the editor clean for working. 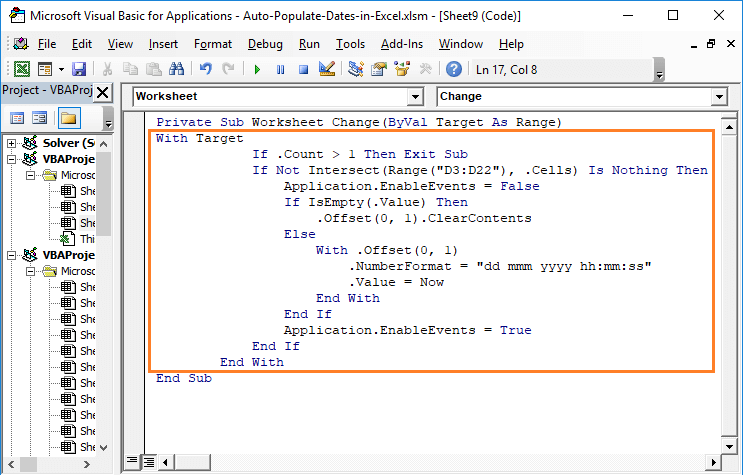 When Worksheet is selected, Change is selected, input the above code in the function area. 7) We are done. 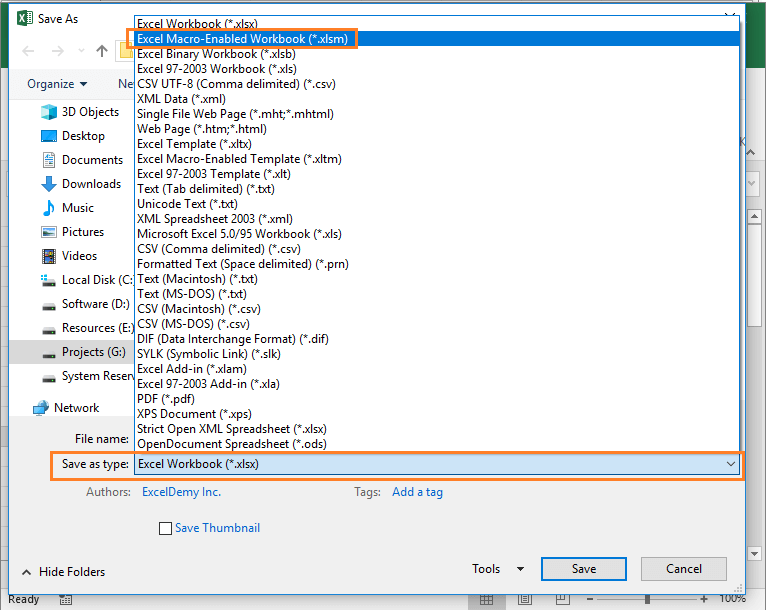 Now save your workbook pressing CTRL + S or from the File tab. You will see the following Microsoft message. This message will show if your workbook is saved with .xlsx extension instead of .xlsm extension. 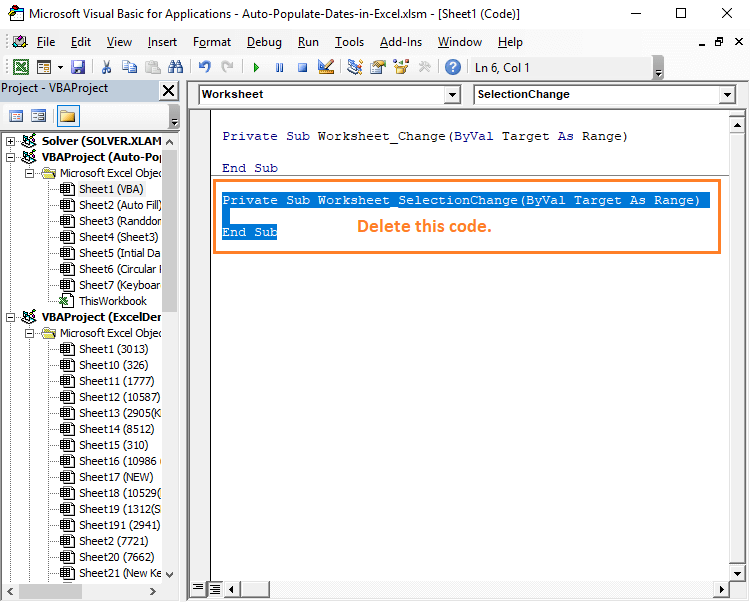 Your workbook now has VBA code, so it cannot be saved with .xlsx extension. Select No as we want to save the workbook as a macro-enabled file type. You cannot save a workbook with macro codes with .xlsx extension. 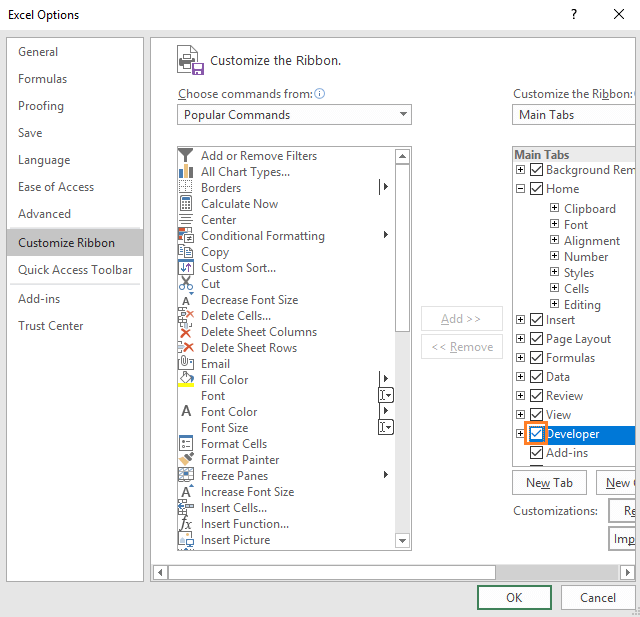 8) Choose Excel Macro-Enabled Workbook (.xlsm) option from the Save as type menu and save the file newly. 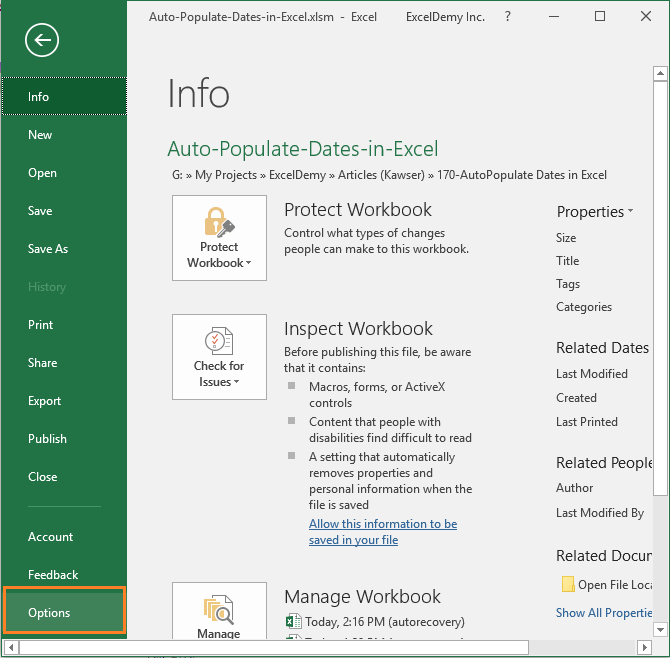 Choose the Excel Macro-Enabled Workbook (.xlsm) from the options. So, this is the whole procedure to auto-populate a cell when a change occurs in the adjacent cell. Say you want to use this code for another worksheet and for specific cell ranges. Like the image below. 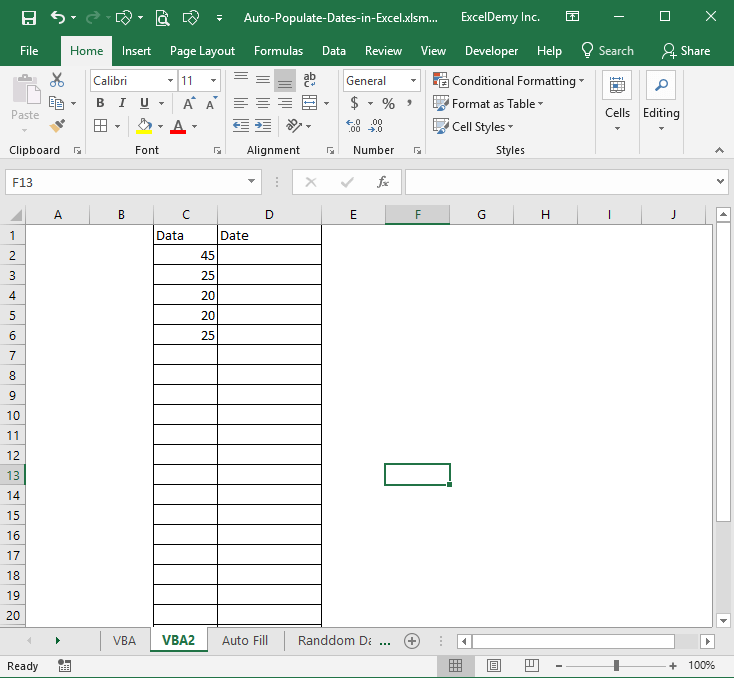 You want to use this code for VBA2 worksheet and for the columns C and D.
We will now modify the above code for different cell ranges. 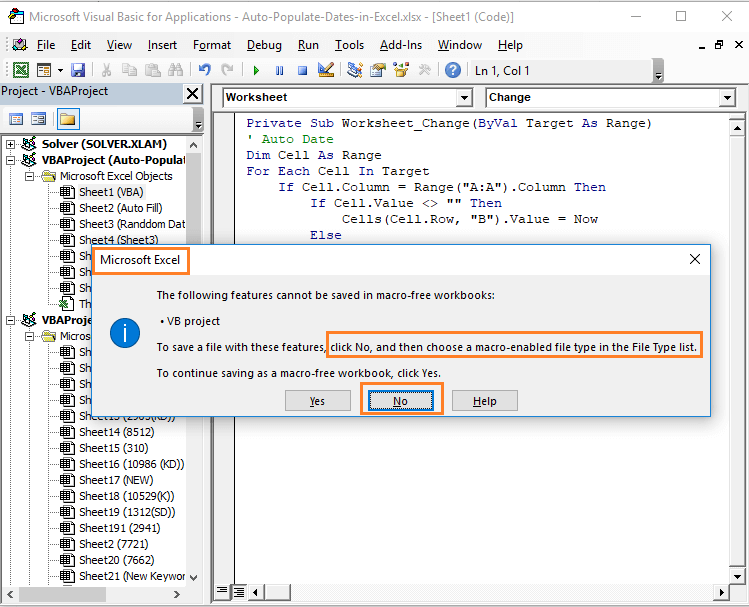 1) Open the Visual Basic editor and you might find that already the previous code is showing while the previous worksheet is selected. 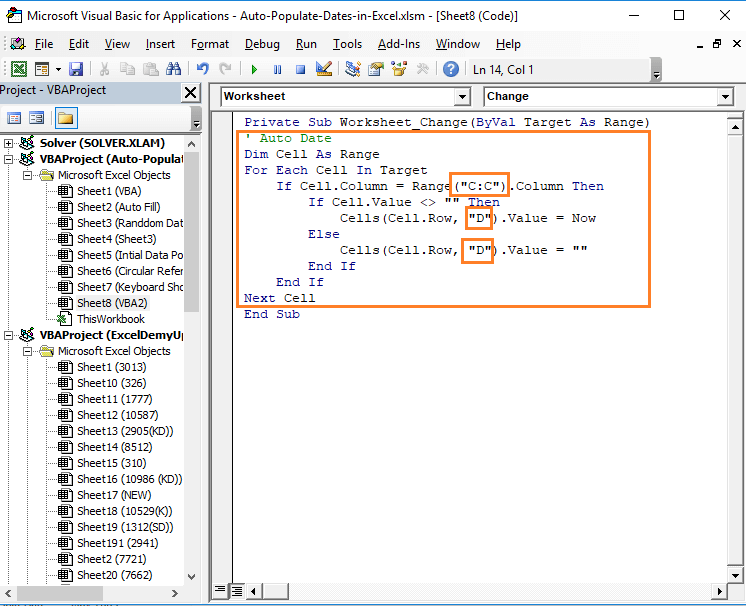 Excel VBA editor will show the existing codes and related worksheet when you will open again the VBA editor. 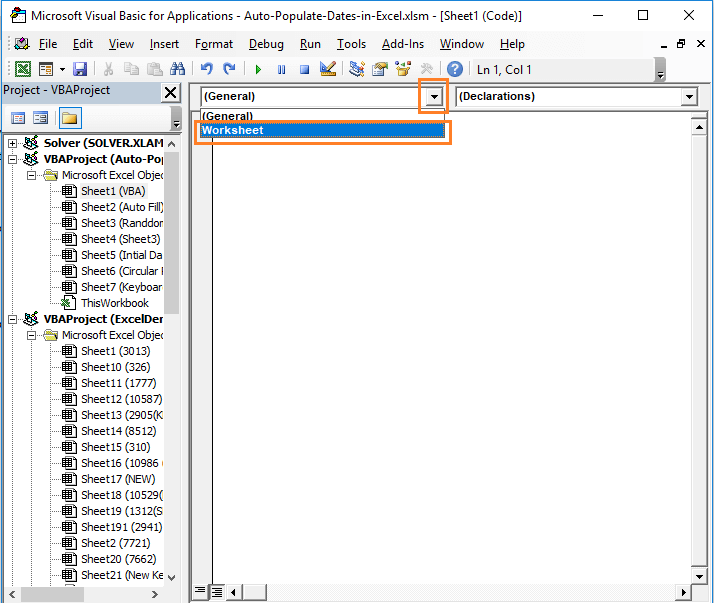 2) Double click on the worksheet on which you want to apply your VBA code. On the right side, choose Worksheet on the left and on the right choose the Change option from the drop-down. 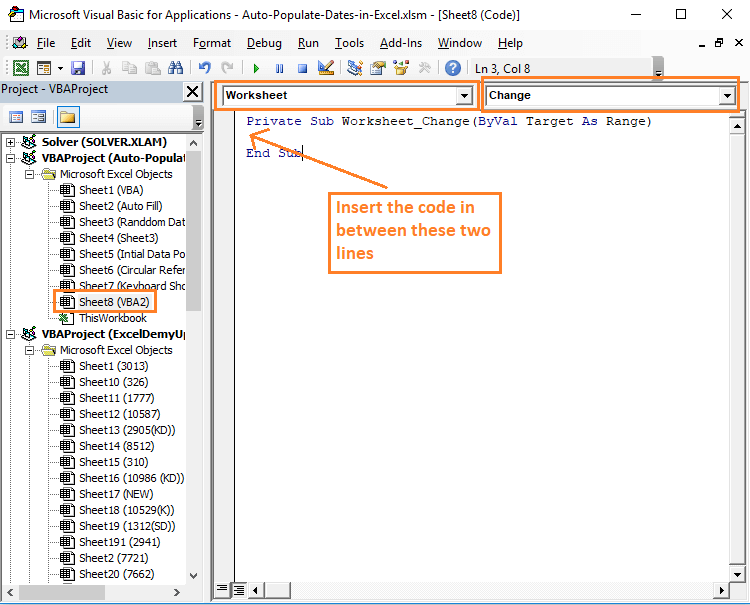 To select code editor for a specific worksheet, you have to double-click on it. I am showing the places where you will make the changes. See where I am making the changes: C:C and D.
Look at the following spreadsheet. 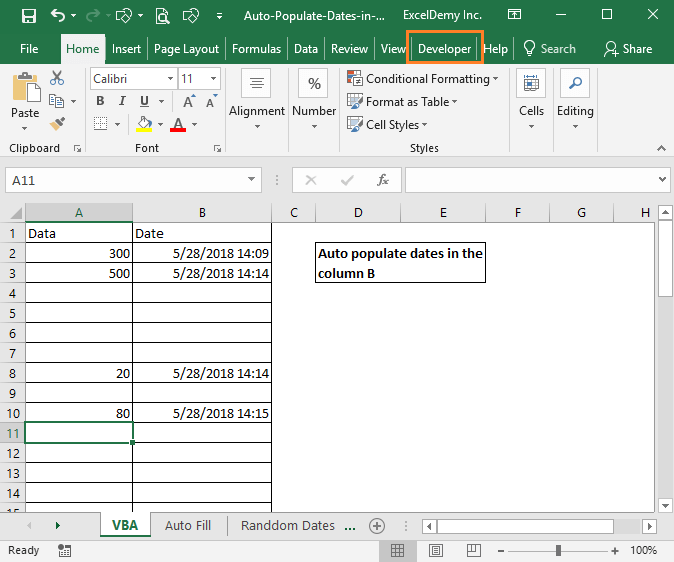 Say, in this worksheet, people can only update data on cell range D3: D22 and adjacent cells on column E will record the date of last changes. 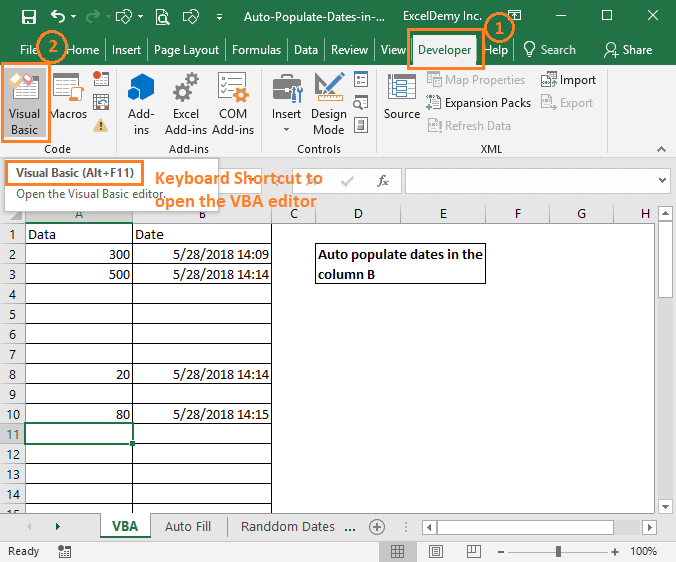 This time we are going to show how to auto-populate dates some specific cells (D3: E22), not the entire column. Input this code and then see the magic. This code will impact only the cell range D3: E22. Not any cell beyond this range. 1) At first, check out whether your worksheet is showing the Developer tab in the tab list. No developer tab is showing in the following image. 2) Click on the File tab. 3) Now choose Options from the left side menu. 4) Excel Options dialog box will appear. Choose Customize Ribbon and then on the right side of the dialog box, you see the Developer option is unchecked. 5) Check the box and click OK on the dialog box. 6) You see, now the Developer tab is showing in the tab list. So, these are two pieces of codes that you can use for your specific purposes. 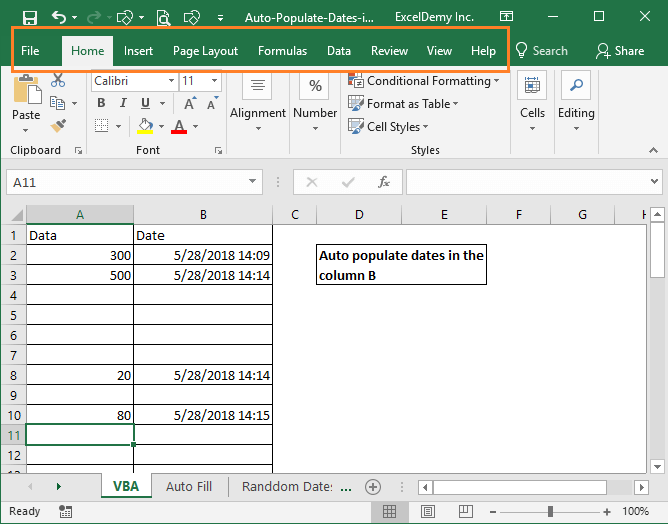 Do you know any better way to auto-populate dates in Excel when cells are updated? Let me know in the comment box. I altered the code to produce different results: Putting the Date in column E and the Time in column F. I am just wondering if there’s a better or shorter way to get this same results? when we normally use as range object we also use set = “something here”. In the very first code above when we declare cell as range we did not use the set keyword. I did not understand why.Can you please explain it to me.